It may seem logical to start with a smaller door when the dog is small and gradually increase the size, but you will have to buy several doors – and install several doors. That is a lot of unnecessary work and money. Most pet doors, like the PlexiDor, open so easily a puppy can figure out to use a larger door. If the puppy is too small to open the door, they’re probably too small to be outside on their own anyway. Puppies are a lot like toddlers and they need to be watched. 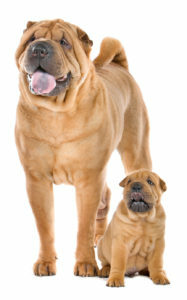 It can be difficult to estimate how large a mixed breed dog will become. In that case you may want to wait a couple of months, until you see the rate at which your puppy grows.